In the first part of this work we study the following question: Given two \(k\)-colorings \(\alpha \) and \(\beta \) of a graph \(G\) on \(n\) vertices and an integer \(\ell \), can \(\alpha \) be modified into \(\beta \) by recoloring vertices one at a time, while maintaining a \(k\)-coloring throughout and using at most \(\ell \) such recoloring steps? This problem is weakly PSPACE-hard for every constant \(k \ge 4\). We show that the problem is also strongly NP-hard for every constant \(k \ge 4\) and W-hard (but in XP) when parameterized only by \(\ell \). On the positive side, we show that the problem is fixed-parameter tractable when parameterized by \(k+\ell \). In fact, we show that the more general problem of \(\ell \)-length bounded reconfiguration of constraint satisfaction problems (CSPs) is fixed-parameter tractable parameterized by \(k+\ell +r\), where \(r\) is the maximum constraint arity and \(k\) is the maximum domain size. 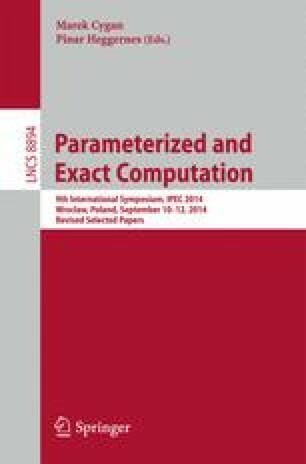 We show that for parameter \(\ell \), the latter problem is W-hard, even for \(k=2\). Finally, if \(p\) denotes the number of variables with different values in the two given assignments, we show that the problem is W-hard when parameterized by \(\ell -p\), even for \(k=2\) and \(r=3\). Amer E. Mouawad, Naomi Nishimura— Research supported by the Natural Science and Engineering Research Council of Canada.